Good morning! Welcome to The Morning Shift, your roundup of the auto news you crave, all in one place every weekday morning. Here are the important stories you need to know. After reports came out that German companies Volkswagen, Daimler, BMW and Bosch were involved in a study testing their diesel-emissions fumes by exposing monkeys to them with a VW Beetle reportedly rigged to cheat emissions tests, VW apologized “for the misconduct and the lack of judgment of individuals” in choosing the study methods. Reports came out soon after that VW, Daimler and BMW did the same kinds of tests with humans, according to Bloomberg via Automotive News. 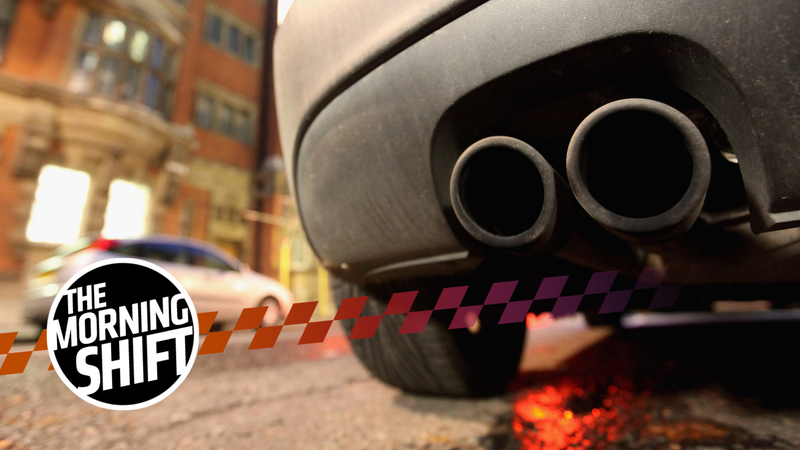 The cars, once marketed as “clean” diesels, cheated emissions tests and actually spit out far higher than acceptable emissions. The fumes can cause respiratory illness and cancer, according to Automotive News. But if it makes the people in the study feel any better, we all had to breathe the fumes once the cars successfully cheated their emissions tests. That’s one way to get the biggest study sample possible: expose the whole world and hope you don’t get caught. The report, citing annual reports from the European Research Group on Environment and Health in the Transport Sector, or EUGT, which closed last year, followed a report from the The New York Times earlier that said the organization also conducted tests using monkeys. Germany’s auto industry, which is still reeling from Volkswagen Group’s diesel-cheating scandal where the company rigged emissions tests, distanced itself from the organization. The reports didn’t say whether those participating in the study were briefed on what it would involve, which sometimes doesn’t happen with psychological studies because it could mess up the experiment. According to Automotive News, the University of Aachen did not have immediate comment about the story. California Gov. Jerry Brown wants a lot of zero-emissions cars on the road by 2030, and he’s willing to pay for it: According to the Associated Press, he went through a $2.5-billion plan Friday to help people in California buy electric cars and increase the amount of charging stations in the state. The number of zero-emission cars is a significant expansion of Brown’s goal of selling 1.5 million such vehicles by 2025. It’s a nearly 15-fold increase over the 350,000 zero-emission vehicles already on California’s roads. The $2.5 billion in spending still needs legislative approval. Brown’s plan would extend subsidies to help people buy emission-free vehicles. It seeks to have 250,000 electric-vehicle charging stations and 200 hydrogen fueling stations, an increase from about 14,000 charging stations and 31 hydrogen stations. California offers subsidies of up to $7,000 for the purchase or lease of a new electric, fuel-cell or plug-in hybrid vehicle, though most subsidies are smaller. Brown’s proposal would give $200 million in subsidies each year for the next eight years. But with all of the expensive big trucks, gas guzzlers and less efficient vehicles starring in the Detroit Auto Show this year, it’s probably going to be more about changing people’s mindsets than changing the price tag on a car. U.S. President Donald Trump has threatened to dismantle the North American Free Trade Agreement for quite awhile now, which, for the auto industry, would likely mean higher production costs, loss of jobs, fewer choices for customers, lower investor returns and a less competitive automotive and supplier market. The sixth round of negotiations ends Monday after a week marked by cautious optimism, with negotiators concluding their first chapter since October and broad discussion about the biggest sticking points. President Donald Trump himself has toned down his rhetoric over the North American Free Trade Agreement, and he isn’t expected to use his State of the Union speech on Tuesday to give a notice of withdrawal as some had privately feared. Now it’s up to Robert Lighthizer, the president’s trade chief, to signal whether the U.S. truly likes what it has seen, as Trump’s threats to kill the pact continue to loom large. With risks of an immediate collapse appearing to have diminished, the next round of talks is scheduled for February in Mexico City. On autos, the Canadians have suggested rewriting how the value of a car is calculated to demonstrate a higher share of local content. The U.S. has called for increasing the regional content in autos and adding a U.S.-specific one. No matter what the countries are calling for, it doesn’t look like we’ll have an answer anytime soon. The show wrapped up Sunday with 100,605 attendees, bringing total ticketed attendance for 2018 NAIAS to 809,161. That was slightly above last year’s figure of 806,554, but below some past years that climbed above 820,000, said Rod Alberts, executive director of the North American International Auto Show for more than 20 years. David Sowerby, managing director for the investment advisory firm Ancora, estimated the 2018 show had an economic impact of $480 million to the regional economy. Too bad those 809,161 people didn’t get to see a new Supra, or whatever Toyota wants to call it, huh? It’s so important to the family because Henry Ford won it in a 10-lap race in October 1901, according to Automotive News, and it put things into place for the Ford company to be founded. The family lost the punch bowl in 1951, but is hoping for good luck after the Bullitt Mustang, thought to be lost, was found. The race has become automotive legend. In effect, it was the Big Bang that began Ford Motor Co. The unexpected victory gained Ford, who was down on his luck after the closure of his Detroit Automobile Co., some positive press and much-needed investors. Besides the bowl, Ford also received a $1,000 prize, which helped him fund a new venture he called Ford Motor Co. Automotive News has more on the backstory, and the Ford family’s pleas to find the bowl. If you have it, they want to put it in a museum. On Jan. 29, 1886, Carl Benz applied for a patent for a “vehicle powered by a gas engine.” According to the history tab on the website of Mercedes-Benz’s parent company, Daimler, newspapers began reporting on public outings of a “three-wheeled Benz Patent Motor Car” in July of that year. It was the first model. You might call today the birthday of gasoline cars. Happy birthday, cars. Neutral: Are You Actually Going To Check Your Dinnerware For A Punch Bowl? Correction: This story originally said second gear was a Detroit Free Press story, when we actually meant the Associated Press. It’s been changed. Alanis King is a staff writer at Jalopnik.